While this certainly didn’t make me feel happy, it certainly made me think about Tokyo fashion yet again. I saw a young woman on the train this evening and she was wearing what could have been the ugliest hat I have ever seen in my life. To make it worse, this woman seemed quite stuck up and refused to move out of the way when someone wanted to walk past. Anyway, this is a very quick sketch I did on my phone -it’s a horrible picture, because it’s a horrible hat. 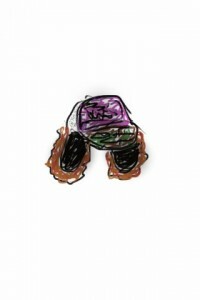 This was basically a trucker hat with hunter’s ear flaps sewn on the sides. The bill was green, grey and black camo -in sparkles. The front had a swirl leaf pattern in purple, hot pink, white and black -in sparkles. and finally the flaps were black with brown and caramel matted fur sticking out like a wet cat. Since it’s a woman in Tokyo wearing it, I’ll assume it’s a designer. If anyone knows who made this or why it was allowed to be sold, please message me! To Be Fashionable This Season, You Need a Tail. This fashion trend began in Tokyo a little while ago, but it’s certainly the “must have” item of the season -especially for the younger crowd. 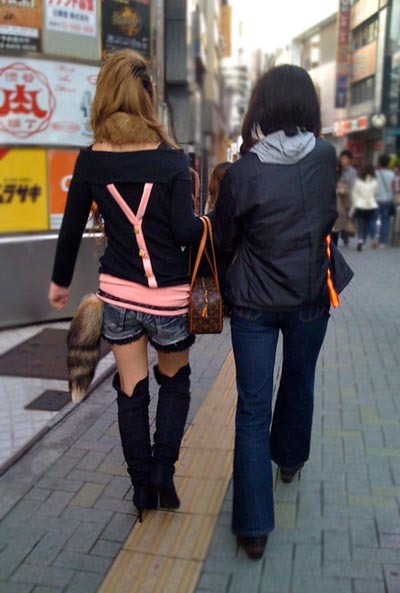 Anywhere you go, whether it’s Shinjuku, Shibuya or Ginza, you’ll see groups of girls with tails, yes, tails. If you would like a tail of your own, you can find it in any number of shops around the city…..even among the eclectic collection at Donki……. but please stick to faux fur! How have all of you been? My apologies for not posting in a while, since I’ve been very busy lately! This past weekend we had our first and second photo shoots for the book and it went well, though we fell behind schedule…..just as I thought we might. You can also check back every now and then to see our site progress and possibly more sneak peaks! I’ll try my best to post projects again, and more updates on the guide! Any book content requests are welcome! 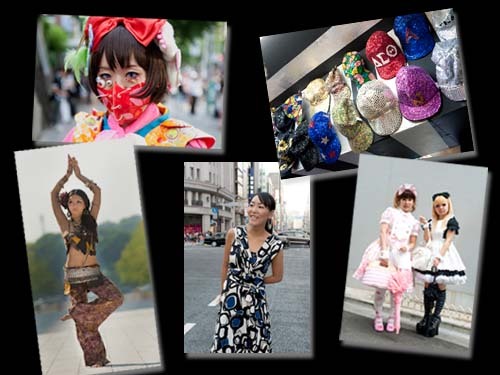 Young girls in Tokyo have the kind of fashion that always makes you wonder. With the fast-changing trends and unusual concepts, there’s always something out there to see and document. This newest piece was first noticed a few months ago and has now gone into a full-blown fashion trend in Tokyo. There are a couple of possible reasons for this trend, but I just can’t understand the “bunny ear” bows sticking straight up from your head. Here is one example, though nowhere near the other bows that litterally stick up like horns -will try to find a snapshot for you soon. I’d love to hear your take on this trend -is it cute or is it odd?